David Collins, a well respected scholar of management gurus proves a critical reappraisal of the very influential work of Tom Peters. This volume examines his key works and reviews his detractors, offering an analysis of his contributions to the field of management that goes beyond the simple chronological model that has previously been used. 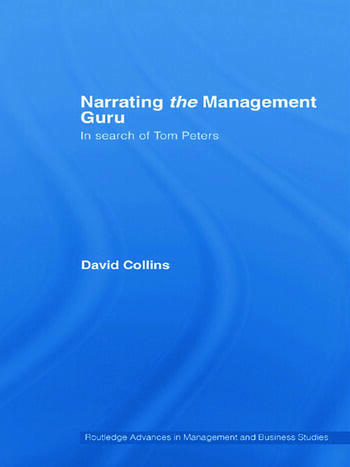 Collins focuses on the changing narratives of Tom Peters and proposes a four-fold narrative typlogy to explore this guru's evolving account of the business of management. The book argues that Peters' success as a guru derives from his abilities as a storyteller. The author notes a decline in Peters' storytelling and an increasing reliance on certain story types. Furthermore he observes that this guru now tends to place himself at the centre of his narratives of business and change. On the strength of this analysis Collins concludes that Peters has 'lost the plot' and argues that new and more appropriate, narratives must be sought and developed. Critical and compelling, this excellent book is a must read for all students and instructors working across the management spectrum, especially in the areas of management, organizational behaviour, change management and corporate strategy.